It's no surprise Denali National Park is one of the top visitor attractions in Alaska - a place renown for its wildlife viewing, allure of the wilderness and of course North America's highest peak, Denali (formerly known as Mount McKinley). When planning your visit to Denali, remember that you can have a Denali experience right here in the Mat-Su Valley. 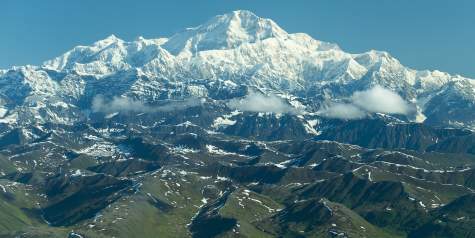 The Mat-Su's northern boundary encompasses the south side of the national park closest to where Denali is located. The southern views of the mountain are downright impressive and more immediate with the mountain being only 50 air miles away from Mat-Su's town of Talkeetna. 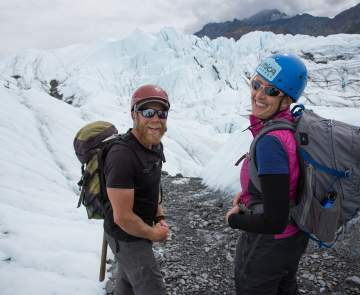 Embark on a flightseeing trip for an up close view of Denali's lofty peaks and granite walls. Early in the summer you'll see mountain climbers dotted along the snow as they prepare to scale one of the world's most challenging mountains. Depending on the snow conditions, you may even be able to land at climbers' base camp. The rivers also lend to excellent views of the mountain and the Alaska Range, located along the southern border of Denali National Park. A jetboat trip whisks you away through braided rivers and the most impressive vantage points for viewing Denali from base to top. Or, take a slower pace on a scenic river float great for the entire family. Many lodges and cabins in Talkeetna, Trapper Creek and Willow are located in prime viewing areas. Wake up to the sun streaking across Denali's face in the morning. You may even find yourself lost in time as you watch the clouds play hide and seek with the mountain's peak. 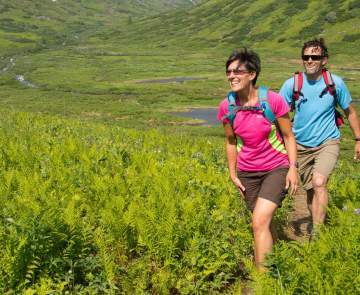 Relax and plan to spend an extra day in the Mat-Su Valley as you journey to Denali National Park. Combining these two experiences will be the ultimate Denali experience.